In 1898, famed conservationist John Muir visited Grandfather Mountain and was in awe of what he witnessed. He wrote about the experience and described the mountain as the face of all heaven come to earth. To be certain, Grandfather Mountain is an awesome sight to behold as it looms 5,964 feet above Linville North Carolina. Grandfather Mountain NC is one of 529 biosphere reserves in 105 countries as designated by the United Nations Educational, Scientific and Cultural Organization. Of these designated areas, Grandfather Mountain is the only one to be privately owned. The late owner, Hugh Morton, was a true visionary who inherited the mountain from his grandfather in 1952 and soon began a life long quest to maintain the mountain as a pristine wildlife habitat while opening it to the public. A truly amazing man and a near legendary figure in the High Country area, Mr. Morton battled the federal government for years to prevent them from using the mountain as a high route for the Blue Ridge Parkway. He eventually won his battle at a great personal expenditure of time, money and effort. 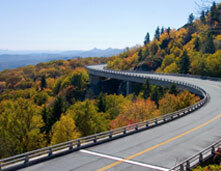 Hugh Morton's victory over the government led to the building of an alternate route which actually created another famous tourist attraction and engineering marvel, the Linville Viaduct. Grandfather Mountain is arguably the most visited tourist attraction in North Carolina. Among its unique features is the famous Mile High Swinging Bridge but this is only one of the features of this nature preserve. Known far and wide for its clearly identifiable bearded profile of a reclining old man in the mountain, Grandfather Mountain is a truly unique place to visit while in the High Country area and is one of the most photographed areas in the Southeast. The mountain is open to visitors and hikers for an entrance fee but is well worth the money as you will be treated to an incredible array of nature's beauty and wonders. An astonishing 70 rare or endangered species live on Grandfather within its 16 distinct ecosystems which include forests which are normally found in Canadian climates. Seven environmental habitats are maintained where visitors can view black bears, white tailed deer, bald and golden eagles, cougars and even playful river otters in an aquarium that allows you to watch them cavort either under water or above. People of all ages and expertise will enjoy the 11 hiking trails on Grandfather Mountain which vary widely in their degree of difficulty. Several trails are quite easy to navigate but there are also a few trails which should be traveled by only the most well conditioned hikers. A number of these difficult trails actually require the use of a system of ladders and cables built into ancient black, near vertical cliffs. Naturalist Weekend A two day event featuring hiking and presentations on the flora and fauna of Grandfather Mountain. Nature Photography Weekend Presentations from many top nature photographers Richard Bernabe, Jack Daulton, Bill Lea, Charles Needle and Nancy Rotenberg. 84th Annual Singing on the Mountain A gospel singing and fellowship event held in MacRae Meadows hosted by the Greene family. 53rd Annual Grandfather Mountain Highland Games ) Reputed to be the best and most colorful celebration of Scottish culture in America. Events such as The Bear: Assault on Grandfather road race, The Grizzly Bike Ride, and The Grizzly Marathon (reputed to be the toughest marathon in America). Kidfest The name says it all. Fun stuff for kids. Guided hikes, games, storytellers and music. 38th Annual American Girl Scout Day As the name suggests, a fun day for Girl Scouts only. Free admission with proof of membership. Bridge To Bridge Incredible Challenge Bike Ride A grueling 102 mile bike ride which begins in Lenoir, NC and culminates at the Mile High Swinging Bridge on Grandfather Mountain. In the autumn, there is no better place on earth to view the awe inspiring fall colors than Grandfather Mountain. From its peak, you will be treated to a patchwork quilt of nature's beauty from between Oct. 5th until approximately Oct. 20th. No visit to the High Country is complete without a visit to Grandfather Mountain.